There's a phenomenon that has interested me for a while, and I noticed a extreme example last weekend. When people mean "yes" they sometimes say "no, yeah" or "yeah, no" and when they mean "no" they say "yeah, no" or "no, yeah" or even "no, yeah, no." On Saturday I was sitting next to someone at a lunch, and I counted four consecutive times when she said "yeah no" in place of "yeah." For example: "Did you like Columbia?" "Yeah no I loved it." (In fact, once I started looking for it, I never heard her say a simple "yeah.") The "no" was almost imperceptible each time, as the meaning was clear, and adding it is a common practice in speech. Do you have any insight into the practice? Patterns in gender or age or situation or setup? Well, there's Vicky Pollard's catch phrase "yeah but no but yeah but ...". Unfortunately, I don't know how to evaluate British class caricatures. Since the conversational sides average about 900 words, this corresponds to frequencies of around 160 to 260 per million words, which makes "yeah no" roughly as common in conversation as words like seem, happy, look, rather. It's clear that the rate of "yeah no" use decreases with age. I'm guessing that if we looked at teenagers, we'd see even higher "yeah no" rates, though I don't have any direct evidence. 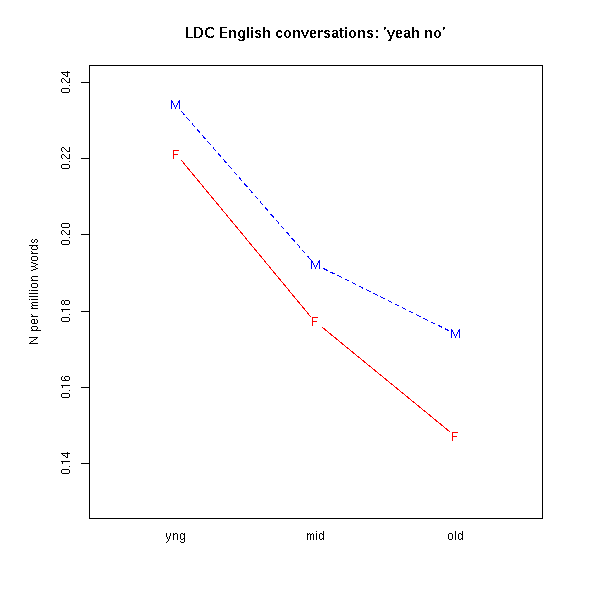 It looks like men tend to use "yeah no" more than women -- but in these conversations, the men produce about 5-6% more words than the women do (as explained here), so the young men are using "yeah no" at about the same rate as the young women, if we count in words rather than in conversations. The "yeah no" gender gap among seniors seems to be real, however. A: Did you like Columbia? B: Yeah no I loved it. Here both yeah and no are independently appropriate -- "yeah I loved it" because the basic answer to the question is positive, and "no I loved it" because love is being contrastively substituted for like. Here it seems to me that in A's "yeah no", the yeah acknowledges B's contribution (and perhaps indicates sympathy or agreement with it), while the no answers the (unasked) question "how about you, can you drive a standard?". But in all the cases that I looked at, the yeah and the no seem be independently appropriate in the context of use, even if the sequence seems surprising when viewed in merely semantic terms. In cases like the last one, "yeah no" covers all the interactional bases -- it acknowledges the interlocutor and (ambiguously) suggests agreement, while simultaneously (and ambiguously) indicating novelty in the form of divergence from (perhaps shared) presuppositions or expectations. Maybe this protean little phrase is so useful that some people become addicted to it, and for them it becomes lexicalized as a unitary discourse marker simply indicating that an opinion follows, or something of the sort. However, I didn't look to see whether there's a different pattern of usage among people who are especially fond of this sequence, as Matt suggests there might be. [I should say that my search turns up some cases where the no is part of another construction, as in the common phase "yeah no kidding". And sometimes, because the search process that I'm using scans each side of the conversation separately, it's combining an isolated back-channel yeah, across the interlocutor's next phrase, with no at the beginning of the next phrase. Yeah-no in Australian English is a relatively new marker which serves a number of functions, including discourse cohesion, the pragmatic functions of hedging and face-saving, and assent and dissent. Drawing on a corpus of approximately 30 hours of both informal conversation and interviews, we analyse the interaction between intonation and turntaking, and the use of yeah-no by topic, conversational genre, and age and gender of speaker. The results indicate that the peak of yeah-no production occurs among speakers aged 35-49 years, and gender differences are not apparent in this preliminary analysis. Unfortunately, Penn's library doesn't subscribe to this journal, and Routledge (a subsidiary of Taylor & Francis) wants $35.90 plus tax for a peek at the article, which is outside my breakfast budget. This is another good example why organizations like the Australian Linguistic Society should sponsor open-access journals, or at least insist on rational access prices -- and why authors should deposit copies of their articles in open-access archives. Anthony Eagle sent along a link to another study: Erin Moore, "Yeah-No: A Discourse Marker in Australian English" Honours thesis, Department of Linguistics and Applied Linguistics, The University of Melbourne, 2007. Anthony writes that "Use of 'yeah no' as a discourse marker is one feature I think of as characteristic of Australian English (I believe on the basis of introspection that I certainly use it)."